I spend a little bit of time reflecting on the past, and not necessarily intentionally; I may not want to deliberately turn a specific page in my personal history, but there it is…turning itself. Seven years ago, I wrote “Foxhole Revelation” as I reflected on the aftershocks, the little earthquakes, rattling from within my immediate family due to some of the more tumultuous elements in our history. Not to offend anyone who has literally survived his or her real foxhole experience due to war or violent crime, my immediate family has referred to each other as “foxhole buddies.” The term reflects the bond we built after walking through our collective history, especially the tough parts. of immature love and misplaced loyalty. the carnage of our youth. Sometimes, it seems almost impossible to sort through the “muck of our history,” to wander with any sense of direction through the “maze of disoriented guilt…grief and responsibility.” I am well-acquainted with my own need to connect the dots, to make sense of how the past, present and future are woven together. Compelled to make meaning, especially as it pertains to pain, loss and suffering, I notice that just because I need it doesn’t necessarily mean that I have the skill or perspective to envision a higher purpose, or a greater good. Or even a way through. People get wounded, and human beings, our memories and our nervous system fully trained by our traumatic or even abusive histories, pass along the energies stored in our reserves through our behaviors, our emotional presence, and even through snips in our DNA. It is comforting to know that we can also heal, and pass along the gifts that become available to us as we continue on that road. For the record, I haven’t fully retired from the occupation of negotiating anxiety and sometimes, depression; I sometimes feel like my feet are planted firmly on the boundary line between darkness and light. This does not mean that I am always suffering, or walking through my days in some kind of torment; it means I get a lot of opportunities to choose. When I learned to ride a motorcycle, I was taught by a veteran rider to turn my head and look where I want the bike to go. It feels counterintuitive, dangerous even, to take my eyes off of the present course, but it is necessary to shift my gaze and press down on the handlebars, usually in a direction that feels…wrong. That is what brings about a shift in the trajectory. Trying to retrain the brain after years or even decades under the influence of toxic stress requires similer counter-intuitive actions, and reactions. I am not ready (or inclined) to share the events leading to the “tired triage of blood and bandages” I describe in the poem, even though those experiences and, more importantly, the elements of healing that follow them, inform most of the writing on this blog. I’m not convinced it would be that helpful, and I don’t want the “dark night of the soul” in my past to envelope my present and future. Nevertheless, scar tissue is sensitive, reminding my connective tissue and nervous system pathways that something happened here, something big, something that informs my cellular memory and influences the way I interpret sensory input. When the “violating dust” unexpectedly becomes unsettled, it’s dizzying. I look at it like the flip of a switch, one that seems to pull me through a portal. Although I may be sitting at home, safe and sound, I can be suddenly aware of some familiar sensations of panic, like I’m being pulled under water and there’s nothing to hold onto. I found an educational psychology focused article by author Michael McNight that differentiates between a healthy nervous system and one that has been challenged by multiple touchdowns on the fight-or-flight pathway. Although the article focuses on children of trauma, and the way to support them, I was mostly interested in the descrition of these aftershocks of toxic stress. “In the face of interpersonal/environmental trauma, all the systems of the social brain become shaped for offensive and defensive purposes. A child growing up surrounded by trauma and unpredictability will only be able to develop neural systems and functional capabilities that reflect this disorganisation.” In a concise chart offered for reference, McNight focuses on what happens to a nervous system that houses “un-discharged toxic stress,” referring to both ends of the response-to-trauma spectrum as being either “Stuck ON” or “Stuck OFF,” like a switch that has been fused due to an unmanageable or damaging power surge. First, no one escapes toxic stress entirely, so many of these symptoms come in and out of our experience as humans, whoever we are. It is also obvious looking at this list that if we are existing within either one of these extremes on an frequent basis, it is clearly unsustainable. Healing is necessary, and absolutely available, but it’s going to take some time, and some counter-intuitive redirecting of un-discharged toxic stress. Personally, I have gotten a lot of help: biofeedback, therapy, meditation and prayer, love and support from my friends and family, and surprisingly, acts of service. Someone told me once (slightly facetiously) that the mind can be a dangerous place – don’t go in there all alone. While I am convinced that I have begun the helpful process of turning my mind into an ally, I haven’t found anything more powerful than serving a community in need to get me out of my negative thought patterns. Sometimes, I prefer to settle on a great movie and gluten free cupcakes. Very helpful. 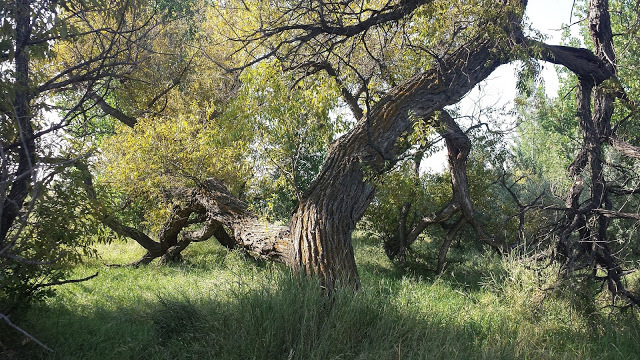 Walking near my home in Colorado a few days ago, I walked by a tree that was stunning, both in its artistry and in its twisted position. It stands, completely swayed, with branches and limbs reaching out so far and so bent that part of the tree lies submissively on the tall grass beneath it. It’s as if it is doubled over, in a yoga pose, or maybe just resting, as if at some point, it meant to permanently fail, but was instead held, supported, by the ground beneath it. It seemed familiar to me, like a foxhole buddy, reminding me that I, too, have been shaped somewhat by my environment. But my core, my center, is both solid and sustained. We lean into the embittered revelations, setting our attention where we want to go. We reach out to the others we know who can offer tools and comfort. Sometimes, in the most beautiful way, we are simply held up by the ground beneath us. I am a mother of three, and l’ll go ahead and admit this up front, a five-time grandmother. A wife (twice), a writer (always) and a teacher, I’ve also been a singer and performer, the youngest daughter of Pat and Shirley Boone, so my point of view reflects a slightly bizarre perspective: a member of a family with a highly public persona combined with that of a sort-of preacher’s kid. It’s an interesting mix, and although I don’t think I am in any way special, I believe that my experience, and the lessons I’ve gathered, are both valid and meaningful. I am not writing to purge, or even really to process. That train has left the station, and I have diaries that go back to the 70s to prove it. Mostly, I am an observer, interested in writing the journey. Writing helps keep me awake and present, and it offers a vehicle for meaningful inner dialogue although it often leads me more frequently to questions than answers.